Recently picked up a couple cases. Main courses and overall menus are identical to the 2017 Lunch options with a few minor additions and replacements to minor items such as the nut mixes. The three duplicated menus were Chicken and Vegetable Stew, Beef Macaroni and Pulled Pork. The only "noticeable" changes are that the menu numbers are now back on the front of the IMPs, the new tan colored pouches for the fruit desserts and the Tic Tac packaging has been made easier to open. Menu Numbers are back on the front of the IMPs. Contents of the 2018 Beef Macaroni IMP. Only change from 2017 was the Sweet and Salty Almonds being replaced by the Crunchy BBQ Mix. I've so far also had the Chicken and Sausage Jambalaya (No subtractions or substitutions but the inclusion of the Crunchy BBQ Mix to the menu) and the Chicken and Vegetable Stew (identical to 2017 though I got a second Peanut Butter. Will confirm with another ration if this was intentional or good luck). I'll report back to this thread with any other changes I see in the other menus though I'm not expecting anything wild. Perhaps 2018 Breakfast and Supper will have much more radical changes . Interesting. Do you have a connection to the Canadian Armed Forces, or did you find these in the civilian world? It is a pain how difficult the can be to get down here in the US. I had a source and got several at a very good price, but when they got more in and I tried to order a case, they decided they couldn't export "food" to the US. Bought them at a local surplus store. I have absolutely no idea how the store gets them but he told me he'd be getting in some 2018 Breakfast and Supper cases with his next order. They contact the armed forces directly who sell them as surplus. Simples *ruh* (meerkat humour). Anywho it's actually a lot of paperwork I'm told but once you're approved you have something like a 5 year window to make inquiries around inventory available and purchase it direct from the military. That's why so many people won't pay $30 for a US mre, because you can buy cases for $40-$50. AND that's why Aussie rations are so expensive. We have a tiny armed forces so don't produce that many rations per year so generally no surplus, you just wait for soldiers to pass on or sell their rations. Or for a couple of cases to go wandering off the base haha (We have 80k active defence force members I believe including reservists). 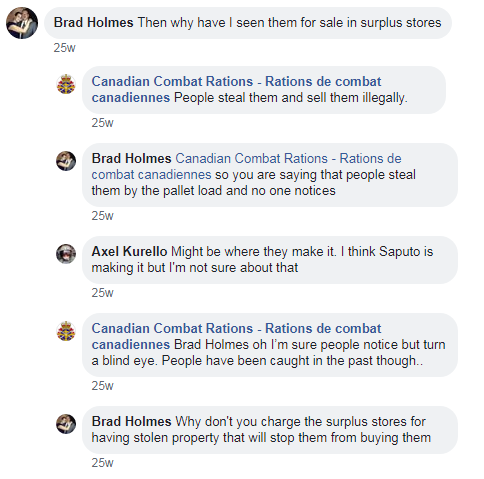 That's what I thought as well (perhaps not the exact process) until I read this post on the "Canadian Combat Rations" Facebook page from April 12th of this year. It featured the following exchange as well. Someone at the Canadian Combat Rations is perhaps uninformed on the situation though my personal belief is that all of it is on the up and up. I cannot say for sure hence my uncertainty on how not only this store but all sellers of Canadian IMPs get their rations. Perhaps they're just towing the corporate line that they aren't for resale? Seems like a weird PR move to say they're stolen and imply a conspiracy. 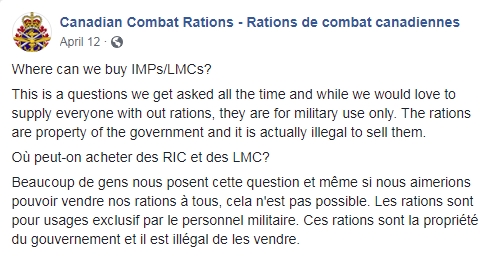 That's again why international onsellers like mremountain will have CR1Ms to sell, but aussie military surplus stores don't. An international seller is at incredibly low risk of negative ramifications, unlikely to be asked where they came from. But an aussie military disposals store would be asked "what the?". Could you be more specific as to the store? Little update on the menus. Pulled Pork was identical to 2017. - The mustard packet has been removed, makes sense considering the meat is already in a mustard sauce. - The chocolate drink mix has been replaced by a vanilla drink mix, much to my chagrin. - Inclusion of the Crunchy BBQ Mix. I think this is going to be in everything soon enough. It seems to be the big change for the Lunch menus of 2018. Note: Matches were included but I stored them with the rest of the pile before I took the photo. In an interesting turn of events, they replaced the Crunchy BBQ Mix with Beef Jerky in the 2018 Chili IMP. Didn't think that would happen. Still no jam which makes for a dry peanut butter sandwich. EDIT: Rather than make a new post and bumping this thread, I'll add an edit here. Lasagna 2018 is identical to 2017. That is all. Had that crunchy BBQ mix today, wasn't a big fan of it actually.